SKATEBOARD ART IS NOT A CRIME: The only thing better than a double latte from French Press (1101 State St.) is sipping it while checking out the art on the walls. This month, the café features work by Israel Forbes and Scott Greathouse, both of whom draw inspiration from the world of skateboarding. Not always a promising genre, it’s true, but both artists take it somewhere interesting. Forbes is a pro skater turned artist whose work shows the influence of graffiti murals and graphic novels. There’s an underground current running through mixed-media works like “Partytime,” a dystopian scene in which five young men with green skin drink and stare into space, separated by a dizzying matrix of lightning bolts, raindrops, swirls, and arrows. In “Five,” a sole character with a shaved head appears in an abstract landscape, where a gust of wind—or is it fire?—threatens to swallow him. The sky is littered with scraps of paper: a price tag, a postage stamp. Of all the pieces on view here, “Hmphry” best captures the artist’s subversive stance. It’s a simple ink line drawing of a disgruntled man—bald again—arms crossed, chin jutting forward. Is this the face of the artist himself, or of the disapproving world around him? In contrast, Greathouse goes for larger canvases, fluorescent colors, and abstract planes on which he often places a single paint splotch. These brushy figures are reminiscent of Rorschach blots, and the artist alternates between leaving them open to interpretation and naming them with titles. “Monsta” is a lime green splodge with an eye, floating in a field of rusty red and steel blue. Virtually any of these acrylic canvases could be refashioned as a skateboard deck and look right at home, in a retro, back-to-the-eighties kind of way. 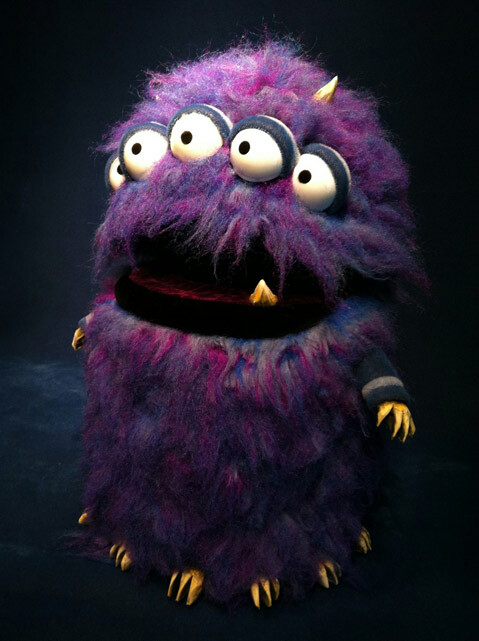 Monster is one of Matt and Ben McAvene’s puppet creations from their Shadowland Explorer project. MONSTER MASH: The latest Art Is Vital exhibit at Elizabeth Gordon Gallery (15 W. Gutierrez St.) isn’t your average art display. It’s more like a party waiting to happen—a group of vivid, colorful characters lifted from a child’s imagination and poised for action. Father-son team Matt and Ben McAvene are the creators of Shadowland Explorer, a fantasy starring the hero “Joh Avridge” and a cast of monsters, jellyfish, and robots. In this show, they appear as puppets, each occupying a star-studded niche on the wall. Matt McAvene is best known around town for his musical offerings, but he’s a versatile and prolific artist in a range of mediums, including puppet making in the tradition of Jim Henson. His creations rival Kermit the Frog and Miss Piggy in their googly-eyed splendor, but take things further into the territory of the surreal. Monster is a shaggy, purple-blue creature with five eyes, eight feet, and one snaggletooth, while Cold Gold is a goldfish gussied up in a pimpin’ suit and decked out with bling. Part of the fun of this show comes from the narratives that accompany each puppet. Joh himself, a speckled lizard wearing a grass skirt and a mystical amulet, comes from a tribe of people who have lost their imagination. His abundant creativity makes him a misfit; the tribe has diagnosed him with an “overactive imagination.” Then there’s Beeps, the R2-D2-shaped robot whose special powers are “communication and gadgetry.” Cold Gold, of course, excels in social networking. These characters are part of an epic story involving Joh’s quest to save his planet from an evil supercomputer—maybe that saga will become clearer at school assemblies, where the characters will come to life. Easily as fun as the puppets themselves are the videos chronicling their creation. Search YouTube for “Finding Picasso,” and you’ll discover a series of short films starring Matt and Ben on a quest to free their creative spirits. The puppets are up through July 13. To learn more about the project, visit mackyworld.com.